Leave the board on your woodie though. Surf scoters (one of my top five most beautiful ducks) have moved in for the winter. The dramatic contrast of black/white/orange on the male surf scoter’s head is strikingly beautiful, though the Halloween colored heads are not the only reason I connect with these birds. Surf scoters and several other ducks (including two other scoter species: white-winged and black) are winter only residents, flocking to our shores after the tourists take flight. They join us only for the short days, clouds, wind and rain that define our region from October to May. I and lots of other moldy, web-footed folk love Western Washington winters. However, others mourn the passing of our sunny summer and begin to pine for sun, fine sand and warm air shortly after the rains set in. Surf scoters as a species have similar and very strong preferences. While a large population migrates from their Northwest Territories breeding grounds to the Salish Sea, many bypass our area and spend the winter in California and Mexico. Most of the southern birds then spend some time in southeastern Alaska before flying to the breeding grounds. The Salish Sea birds are true devotees to this place. Just as a summer visitor might return to their favorite cabin or campground, about 90% of the birds that return for the winter to hang out in the exact same spot they spent the previous year. They also stay here until they’re ready to go to their breeding grounds. 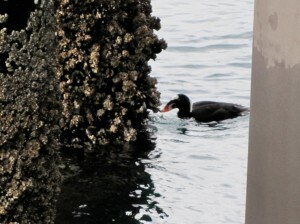 When the tide’s out, you may see the surf scoters nibbling on the community of critters that’s developed on pilings, targeting small mussels and crustaceans. You might also see them diving, sometimes in unison as they search for similar fare on the seafloor or in eelgrass beds. When herring spawn, scoters fatten up on the eggs in preparation for the breeding season. 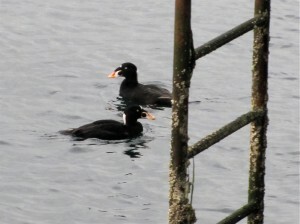 The Puget Sound population of scoters once represented about 2/3 of the total West Coast population, but the number of birds declined precipitously in the 1980’s and particularly in 1990. They seem to have leveled off in numbers but represent about half the number of birds that were here 30 years ago (pollution? herring problems? hunting?). The decline also represents the greatest loss of Puget Sound marine bird biomass in the last 30 years. You can find more information with calls and maps at Seattle Audubon’s BirdWeb. 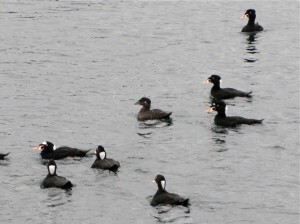 The 2007 Puget Sound Update also has a nice section on scoters. If you and a flock of scoters share a favorite shoreline haunt (whether a ferry, pier or bit of beach), take some time to get to know them. When they take flight in the spring, you can wish them well and holler “See you next year!” Those that survive will return to share the winter love with you once again.